The first hour or two in French Canada is always a bit disorienting for me. It takes a few encounters with the locals to fully acclimate myself to the notion that these people really speak French rather than English. There are warning signs, of course, like the fact that all the signage is in French and the radio stations are populated with francophones. But when you’re coming from the English juggernaut that is ‘Merica it’s hard to comes to terms with the notion of people speaking anything other than English or Spanish. There’s always a slight feeling that speaking French up here is nothing more than a cute affectation, the way prosperous suburban towns will dress up their Dunkin’ Donuts and McDonalds in pseudo-Tudor architecture, as if they were serving hot crumpets and blood pudding inside rather than American fast food. But no, not only do these people legitimately speak French (even if it’s not quite Parisian French), in many cases they speak English with atrocious French accents. Their linguistic pride runs so deep that they apparently refuse to do so much as dip their toes into the English ocean that surrounds them. You can go days up here without hearing anyone pronounce a proper th, despite being within spitting distance of New England (not that the English heard in places like Maine is much better). Yet this wasn’t some sort of anthropological linguistics trip, as fascinating as that topic may be. No, I was heading into the Great Concavity Great Convexity French Canada for the prestigious 2012 Canadian National Championships/Olympic Trials. It’s not exactly the 2011 World Championships in Paris, but the people were speaking French, and at least it wasn’t located in Hell EuroDisney. Somehow I was talked into this trip by none other than USAW man-about-town and minor Buffalo celebrity Mike Graber. His own motives, apart from watching some of the best weightlifting just south of the North Pole, were the usual ones: female weightlifters. Not content to focus his efforts on one prospect alone (i.e., Spain’s Lidia Valentine), Graber has instead adopted the shotgun approach, hoping to snare one of these women through a somewhat scattered attack. Naturally I had to come along, both for documentary purposes and in case he sparked some horrible international row between USAW and the Canadian Weightlifting Federation. Also with us was the owner/photographer for hookgrip.com, who for the duration of the trip went by his French Canadian pseudonym, Jean-Nàt St.-Arèm. The competition was held in the appropriately French-sounding École secondaire De La Magdeleine, in La Prairie, Quebec. It was only a short drive from our four-star Comfort Inn hotel–indeed it was on the same street as our hotel–but on the morning of the competition’s start Graber and I still managed to get lost. Apparently Graber was of the belief that any Canadian is good for directions anywhere in country, and had gotten his directions to the venue from Manitobans, which is like asking someone from Fargo, North Dakota how to get to Lost Battalion Hall from Manhattan. As a result we ended up driving in the wrong direction for something like thirty minutes, which is unfortunate since the venue was less than 7km from our hotel if only we had been going the right way. When we finally made it to the venue the competition was well under way, although there was plenty of lifting left. All of Saturday was devoted to the men’s sessions (56 to 105) and Sunday featured the women as well as the men’s 105+ session. 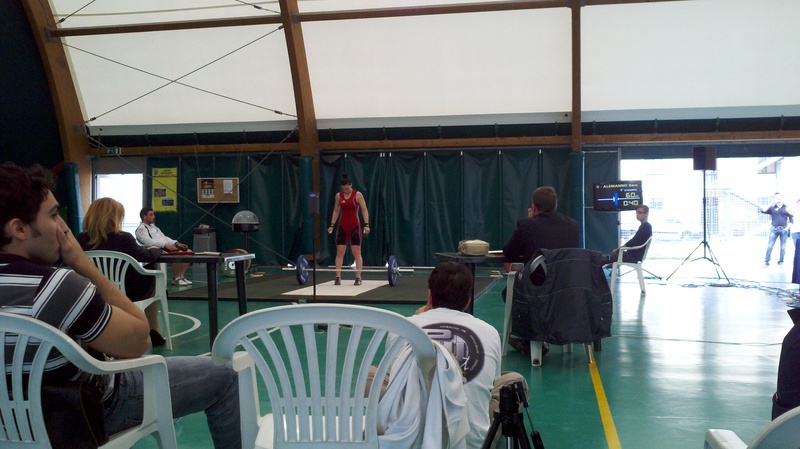 The venue, a high school gymnasium, was well laid out and appropriately festooned in weightlifting paraphernalia for the event. The platform wasn’t raised but the venue had bleacher-style seating, making visibility good from almost all seats. 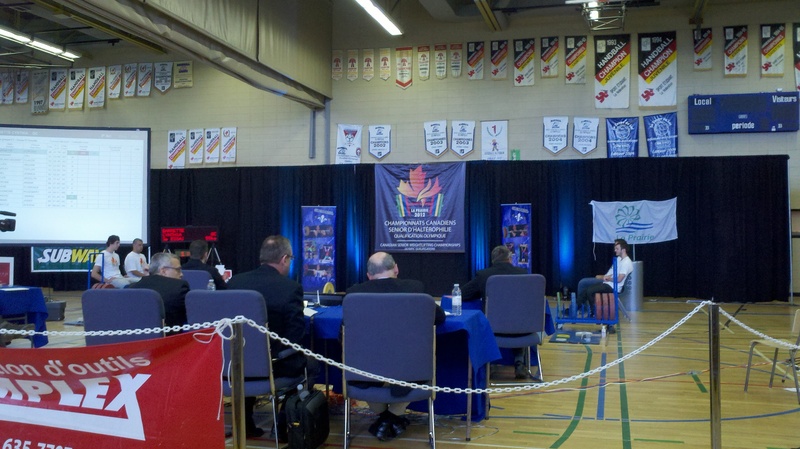 the banners on the walls are almost exclusively for handball, which is apparently a legitimate sport in quebec. Over the course of the competition I saw some solid lifting by both the men and women. The technique of the best Canadians is as good or better than anything seen this side of the border, even if it’s not quite up to par with the top lifters from places like Russia or China. Unfortunately the Canadian men don’t have an Olympic spot, at least not yet, so there’s not much to relay on that qualification front. At the last-chance qualifier, the 2012 Pan Ams, the men’s team ended up in eighth place, one spot shy of earning a men’s spot. The situation seems to be as much about poor luck as anything else, since I can say that–at least for the classes up to the 77s–Canada’s top male lifters would do quite well at the American nationals. The gap is not so large as one might think. Only in the upper classes–the 85s to a degree, and the 94s, 105s, and the supers–do things start to diverge. It’s tempting to imagine that the greater number of Americans who fill out the heavier weight classes is responsible for this, although there may be any number of reasons. 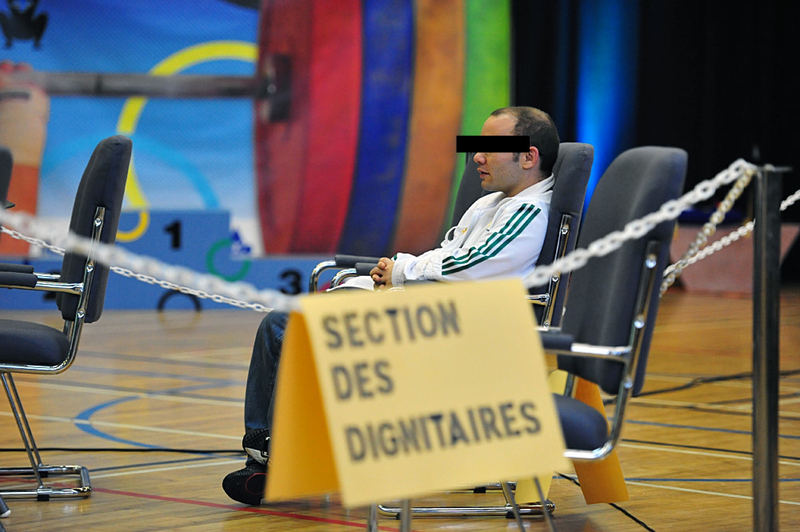 this photo (courtesy jean-nàt st.-arèm, hookgrip.com) has been altered to protect the identity of the dignitary. points if you can guess who it is. The women, by comparison, managed to secure themselves three Olympic spots, one more than their American counterparts. On the morning of Sunday’s competition we ran into one of Canada’s outstanding female lifters, Christine Girard. Graber spotted her at the counter the moment we walked in. Once he had done so I knew a confrontation was inevitable, and thus I did a quick scan of the place for my exit options and tried to remember how to say “I am not associated with this person” in French. “That’s Christine Girard,” said Graber. He came dangerously close to rushing her in the midst of her transaction but wisely decided to stay behind. His excitement could only be contained for so long, though, and as she walked by us to leave that fine dining establishment Graber leapt forward like a gazelle. “Good luck today, Christine!” he blurted in mid-air. She paused and started blankly. What was she thinking? I wondered if I should let her know that despite appearance he wasn’t actually dangerous. At least not as far as I knew. As the moments of silence ticked by I then wondered if she might become dangerous, which is not something to take lightly for a top-10 international weightlifter. He offered another, quieter, “Good Luck,” and at this Girard seemed to recognize the statement for what it was. She might have offered a brief thank you–I was looking away by this point, pretending to read the menu–and then she left. Luckily he didn’t throw her off too much, and Girard managed to post a solid 233 total, despite making only two lifts of 103 and 130 on second attempts. Impressive numbers for a 63-kilo lifter. Other Olympic team members are likely to be 69-kilo lifters Marie-Ève Beauchemin-Nadeau–proudly displaying the French Canadian tradition of liberal hyphen usage–and Valérie Lefebvre, whose last name features a consonant cluster–bvr–that up until recently I thought was impossible in any language. * [EDIT: it appears this is not correct, as Graber has just called to inform me that the third Olympic team member is Annie Moniqui, a 58-kilo lifter.] Lefebvre managed 95 and 115 for a 210 total, while Beauchemin-Nadeau did 100 and 130 for a 230 total. Graber’s antics aside, the competition was interesting from a cultural perspective, at least to me. Just two weeks prior to the Canadian Nationals I had been at an Italian competition, gareggiare-ing and spectating. It was a regional qualifier in Fondi, about two hours south of Rome, for the Italian Nationals. Comparing the two meets is not exactly apples to apples, or pommes to mele, but it’s not like I’ve ever held myself to the standards of scientific rigor before, and I’m certainly not about to start now. The question on my mind for these two meets was how Italian and Canadian they would each be. The answer is “notably so”, although not in any way that approaches parody or stereotype. The Italian competition didn’t feature a spaghetti dinner at the end and nobody went on strike during it, although there was a stand selling caffè and panini, and midway through the event there was a pause to allow everyone working and lifting a quick cigarette break. But otherwise the competitors were weightlifters like you’d find anywhere, although I did see a lifter drinking a beer and smoking before his session. ** The only other truly Italian element was the “waiver” I had to sign pre-competition exempting the organizers from any responsibility, since I was a foreign lifter. 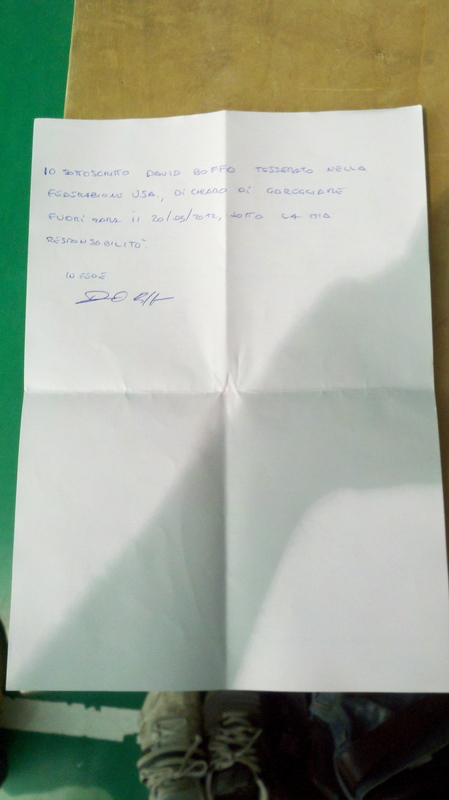 Like all Italian contracts it was some kind of common-law pact, written on a piece of looseleaf paper. I’ve seen housing contracts in Italy written similarly, so this wasn’t anything out of the ordinary. the document in question. this sort of thing is normal in a country with a ruthlessly inefficient bureaucracy. So too did the Canadian Nationals feature a few details that clearly marked the meet as Canadian. Lifters were generally a bit more polite and less ludicrously ostentatious than the ones you find at American meets, everything was in French and English, and we all got free healthcare and a jug of maple syrup. Of course, in this evaluation it helps to remember that this wasn’t just Canada, but French Canada, and so European touches might be expected. The only one I saw was the presence of attractive young ladies in black miniskirts present at the medal ceremonies. That’s the sort of thing I expected to see in a place like Turkey or Paris, where old-fashioned nods to patriarchy are tolerated and even appreciated with a sly wink and nudge, but I didn’t expect it in Canadia, which seems a bit too liberal for that. And as a Canadian gent informed me, that sort of thing is not at all the norm when the other provinces hold the Nationals. How appropriate that Quebec chose to put its linguistic and cultural differences on display through the presence of these ladies, like a trio of little Eiffel Towers or a plate of madeleines. But I digress. Of course competitions in different countries are going to feature cultural differences. German meets are probably ruthlessly efficient, Chinese meets are filled with countless competitors, and Spanish and Greek meets are probably bailed out and bankrolled by ze Germans. Enough. I’ll leave you with some of the last words I heard from Graber, before I began my long and scenic drive back to Maine. 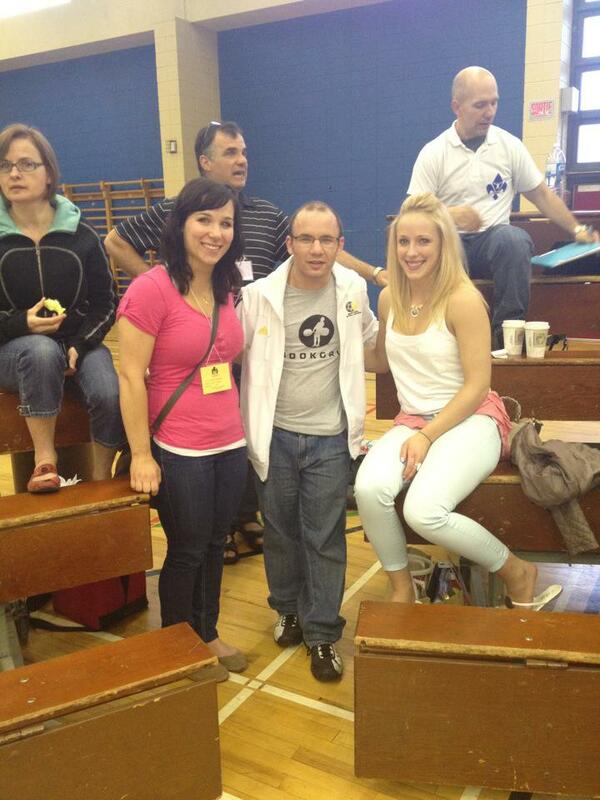 valérie lefebvre, marilou dozois-prévost, and 2011 USAW national champion/dignitary mike graber. Righty-o, Graber. Sure enough, a moment later he had leapt out of the Dignitaries section and was bounding toward Marilou. He has the rare quality of following through with what he says he’s going to do, whether it’s going to the Worlds or the Canadian Nationals or striking up a conversation with female Olympians. That’s an admirable quality, even if it doesn’t always result in the most prudent course of action. But judicious people aren’t all that fun to hang out with, nor do they often make for interesting stories, two criticisms which nobody could level at Mr Graber. ** I also ended up losing to this competitor. Technically we were not competing with each other, since I was lifting fuori gara, as an extra lifter, but we were both in the same weight class. His pre-session beer and smoke strategy resulted in a three-kilo edge over me. This entry was posted in olympic weightlifting, travel, Uncategorized, weightlifting and tagged canada, graber, hookgrip.com, la prairie, montreal, olympic weightlifting. Bookmark the permalink. Coincidentally, London 2012 will feature male medal bearers. No word on the uniform just yet. Something was wrong with the editor. Second video at 7m 25s.